When UMaine social scientist Sandra De Urioste-Stone and her students conducted climate change research in Mount Desert Island’s Acadia National Park (ANP) in 2015-16, many of the park visitors interviewed said one of their greatest concerns for future visits was the perceived threat posed by ticks and the possibility of contracting Lyme disease. This in turn led to a new Mitchell Center-funded interdisciplinary project De Urioste-Stone and her colleagues are currently conducting in ANP to develop a model that integrates data from biological, climate, and social science research and will be used to identify ecological and sociocultural factors that influence the risk of human exposure to Lyme disease transmission. Student Lucy Guarnieri collects ticks in Acadia National Park. The model, which could eventually be replicated in other National Parks, would provide park rangers, interpreters, and managers with solid information to share with park visitors that would make them aware of areas of high-risk for tick bites, and help them make informed travel decisions. In 2015, the U.S. Centers for Disease Control ranked Maine third in documented incidences of human Lyme disease (only Connecticut and Delaware ranked higher), and outdoor recreation could be adversely impacted as some visitor groups become afraid of activities that may expose them to ticks. “We’re trying to see how we can use a variety of techniques from our different disciplines to integrate biophysical and social science data so it’s comparable and can be used in other park locations,” says De Urioste-Stone, assistant professor of nature-based tourism in the School of Forest Resources and Mitchell Center faculty fellow. For the social science component of the project, graduate students Lydia Horne and Alyssa Soucy, and undergraduates Asha DiMatteo-LePape and Hope Kohtala go out weekly and talk to park visitors about their knowledge and risk perceptions about ticks and tickborne diseases and tally where in the park visitors have been and what type of recreation activities they’ve done, such as hiking particular trails. They also ask what kind of protective behaviors visitors practice with tickborne disease in mind, including such actions as using repellents or wearing long pants tucked into socks. They conduct what’s called two-stage cluster sampling, meaning they randomly select the dates, times, and locations when they’re in different parts of the park, and once in those locations, they randomly select visitor groups. “That allows us to make sure we’re randomly selecting participants and are then able to generalize to a larger population of visitors to Acadia National Park,” notes De Urioste-Stone. Partnering with De Urioste-Stone is Allison Gardner, assistant professor of arthropod vector biology in the School of Biology and Ecology and Mitchell Center faculty fellow who studies the ecology of ticks and mosquitoes. 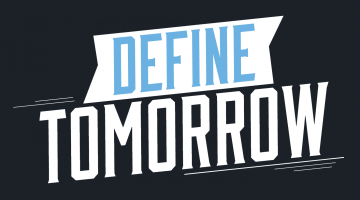 Other team members include Danielle Levesque, an assistant professor of mammalogy and mammalian health in the School of Biology and Ecology, and Sean Birkel, a research assistant professor in the Climate Change Institute who works on climate modeling. “The main goal of our research is to develop a risk map for exposure to blacklegged ticks (also known as deer ticks) in Acadia, which requires that we identify the factors that affect their distribution,” Gardner says. 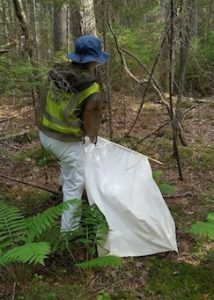 The tick survey component of the study is designed using 20 core sites, the same sites used in the most recent published census of ticks in Acadia 30 years ago. An additional 30 sites were used to collect ticks once in July when the nymphs— the life-stage that is most likely to transmit infectious diseases to humans—are active. Leading the fieldwork are two of Gardner’s students—master’s student Sara McBride and undergraduate Honors student Lucy Guarnieri. All the ticks collected over the summer will be tested for Borrelia burgdorferi, the pathogen that causes Lyme disease. The species distribution model will show where in the park ticks would be expected to be found based on such factors as the type of vegetation, local temperatures and the presence of small mammals. 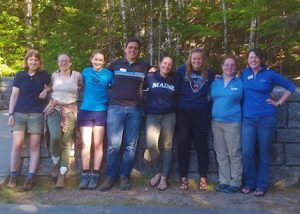 Members of the Acadia Research team include, left to right, Allison Gardner, Sara McBride, Lucy Guarnieri, Nathaniel Burke, Asha DiMatteo-LePape, Hope Kohtala, Ashley Cooper, and Lydia Horne. External partners include ANP, the Maine Medical Center Research Institute, and the National Park Service. 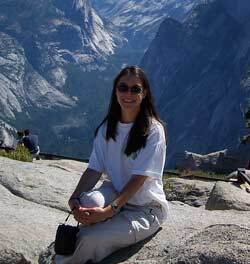 Danielle Buttke, one of only two epidemiologists assigned to oversee public health prevention and response in the National Park Service, is a member of the project. Gardner notes, too, that the impetus for her crossover into the social science realm began when she started attending the weekly Mitchell Center Sustainability Talks shortly after arriving from the University of Illinois. Allison Gardner and Carly Sponarski, assistant professor of human dimensions of wildlife and fisheries conservation and Mitchell Center faculty fellow, are part of another UMaine tick project that recently received funding from the U.S. Department of Agriculture to develop and test land management practices to protect Maine forest workers from exposure to tickborne diseases. Sandra De Urioste-Stone, Pauline Kamath, assistant professor of animal health in the School of Food and Agriculture, and Anne Lichtenwalner, director of the UMaine Animal Health Laboratory, are part of a research project to study the moose-winter tick system through Interdisciplinary Undergraduate Research Collaborative and Research Reinvestment Fund (RRF) Graduate Student grants. Gardner, Danielle Levesque, and Sean Birkel are part of an interdisciplinary research project to study the impacts of temperature and snowpack on overwinter survival of blacklegged ticks, supported by an RRF Graduate Student Assistantship grant.